Contract name "Ersatz Heimdall". Christened by Princess Alexandra Victoria. The Friedrich der Große was the 8th ship in the battle group line after the four König class of the VI Division (She sailed behind Prinzregent Luitpold and ahead of Ostfreisland, flagship of Admiral Schmidt). The III Battle Squadron was followed by the Kaiser class of the VI Division, 17:48 - 17:52 Friedrich der Große with 10 battleships engaged the 2nd Light Cruiser Squadron. Later the Friedrich der Große targeted HMS Nestor and sank her (Nassau also scored a hit). After 19:00 Behncke tried to cover the Wiesbaden with the III Squadron and most of German ships were firing on Warrior and Defence. However, Friedrich der Große and the I Squadron fired on Warspite at a range of 9.600 to 12,500 yards. 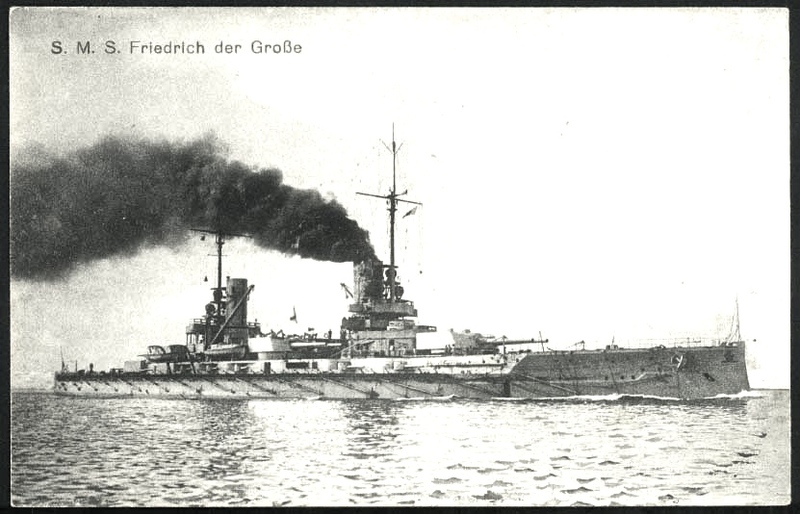 In the night steaming, Friedrich der Große was the 9th ship in the line of 24 ships headed by the ships of the I Squadron. After 01:00 HMS Black Prince ran into the German line by mistake.The Thüringen illuminated her and Friedrich der Größe, Thüringen, Nassau and Ostfriesldand finished her off. Black Prince blew up with 857 on board. 3 shaft AEG Curtis turbines with top service rating of 31,000 shp.